It was our anniversary a few weeks ago. Steve is supposed to write restaurant reviews on this blog but since his schedule has been absolutely crazy, before we forget about our experience at this restaurant, I decided to go for it. As I just took quick snaps with the phone, pictures don't show it all but we were quite impressed with this place. At first we planned to go to the restaurant we have been going for our anniversary for the last few years, but changed our minds and decided to give it a try on a local restaurant. We weren't super hungry so we skipped the appetizer although it was very tempting as everything sounded good and what the couple sitting next to us were having looked amazing. 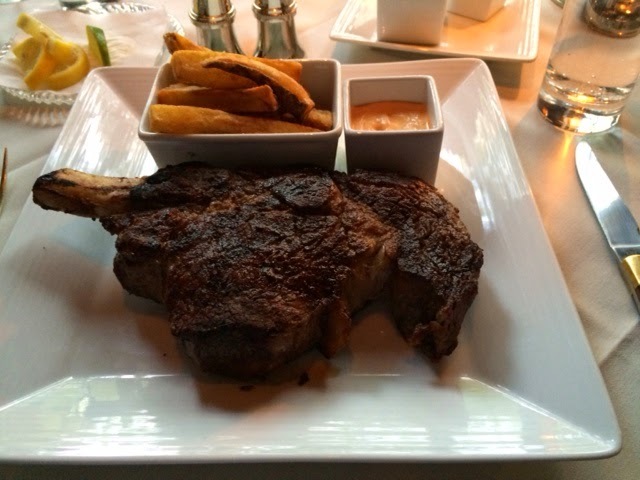 Delicious rib eye steak with fries. It comes with foie gras butter which Steve said no to. Perfectly cooked, juicy and tender. 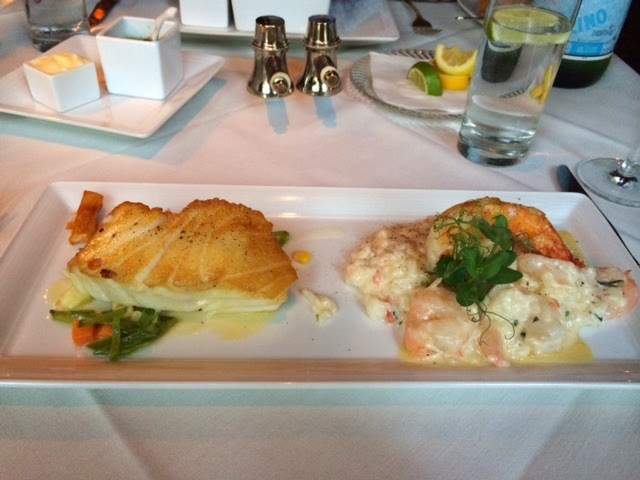 Chilean seabass with shrimp risotto. Surprisingly a lot of shrimp in the risotto even though it's a side. Creamy risotto, cooked to al dente with perfect seasoning was very satisfying. Seabass was very yummy too but my only complaint is, it was room temperature. Wonder if it was sitting while Steak was being cooked or rested. Sorry for the terrible picture. I forgot to take a picture and took a biiiig spoonful of the dessert. 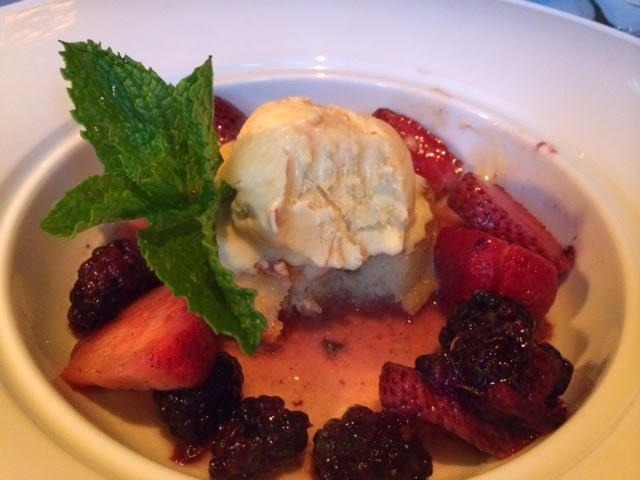 It's a French toast pound cake topped with vanilla ice cream. I initially wanted Kalua cappuccino but since I still had half a glass full of Prosecco, I just decided to drink it with the dessert. And as our waiter placed the dessert on our table, he spilled my Prosecco on Steve's pants. He right away, offered to replace the Prosecco($14) but I said I'd take Kalua cappuccino($11) instead. And when we got the check, we were surprised to see that he charged for that cappuccino. Other than that, service was great. Attentive staffs. Overall, it is in a little higher price range but the atmosphere, quality of food and service(except what happened to my Prosecco) was amazing. I absolutely loved the home/library like decor and all the details inside and out. I would recommend this place if someone's looking for a special occasion restaurant in the area.